Stephen Harper’s new passion for restoring the British monarchy to the kind of position it enjoyed in Canada before the Second World War may be impressing a few people in other parts of the global village today. But others who watch Canadian current events remain unconvinced. 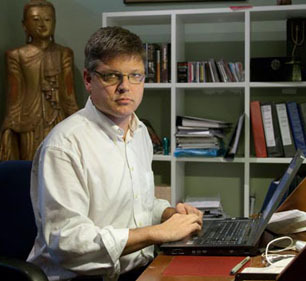 As some counterweights readers will already be aware, the prominent Australian barrister, public policy advisor, and champion of high liberal causes, Greg Barns, was National Chair of the Australian Republican Movement from 2000-02 and National Campaign Director of the ARM 1999 Referendum Campaign. His colleague and co-author Henry Pill is Convenor, Tasmanian Branch of the Australian Republican Movement. We are fortunate in being able to make available a somewhat condensed version of their February 4 paper to interested North American readers (where “North American” here happily includes the Caribbean Sea). Click on “Read the rest of this page” and/or scroll down to take a look at what Mr. Barns and Mr. Pill have to say. If you are interested in this issue at all, you won’t be disappointed. There is in the Australian discourse on the future of the British monarch as head of state little by way of perspective on how that institution is faring in other countries of the Commonwealth. It is as though, outside the United Kingdom itself, Australia is the only nation to be saddled with the colonial legacy of a foreign monarch as constitutional figurehead. This is of course not the case. The British monarch is head of state in 16 of the 54 current Commonwealth countries. There is some significance to this statistic. It means that in less than one third of the nations bound by a British colonial past is the monarch in Buckingham Palace still the head of state. Since India became a republic on January 26, 1950, the days of the British monarch as head of state in Commonwealth countries have been numbered. The sun is setting on the role of the Queen, or King, as head of state in so-called Commonwealth realms. We suggest that the sun will continue to set on Buckingham Palace’s global reach in this respect. And one reason is that nations within the Commonwealth are seeking to forge new symbolic identities consistent with the emergence of new international powers in the 21st century. Here we examine related recent developments in Canada and Jamaica. These are two prominent Commonwealth countries where the “sun is setting” sentiment is gaining momentum — and where there is an emerging dialogue about how to best position surviving Commonwealth realms in a 21st century world where the United Kingdom is a shadow of its former imperial self, and where its key current ally, the United States, is also likely to be eclipsed by China, India, Brazil and other emerging powers in a new kind of global village. We think that developments in Canada and Jamaica are highly relevant to the debate about an Australian republic, and that Australian insights can be gained by examining how the republic issue is now being explored in those two other contemporary Commonwealth realms. 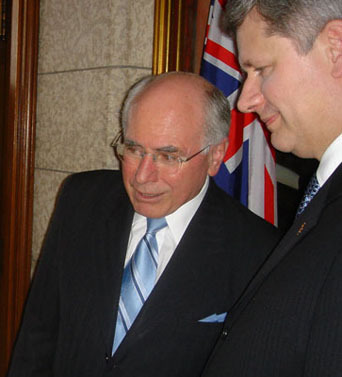 John Howard and Stephen Harper, with Union Jack lurking in background. Late last year Canada’s Conservative Prime Minister Stephen Harper, a close ideological and political soul mate of arch-monarchist former Australian Prime Minister John Howard, ordered Canadian diplomatic missions around the world to show pictures of the Queen in their offices. He also revived the old “Royal” prefix for the Canadian navy and air force. 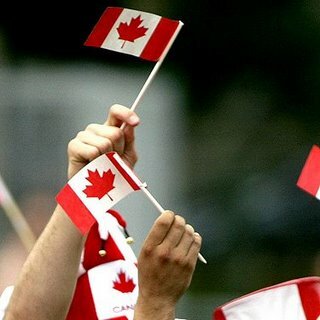 Almost two years ago now, the highly respected Globe and Mail columnist Jeffrey Simpson was urging that Canadians are becoming more confident about their own identity and symbolism. He contrasted the then Canadian Governor-General, Haitian born Michaelle Jean, with Prince Charles, who visited Canada for the Vancouver Winter Olympics in 2010. At the Liberal Party of Canada convention in Ottawa, January 2012. REUTERS/Blair Gable. In the much more recent past Simpson’s theme has been picked up, albeit gingerly, by the Liberal Party of Canada. The Party’s January 2012 national Convention debated a resolution from the Party’s youth wing on moving towards a republic. 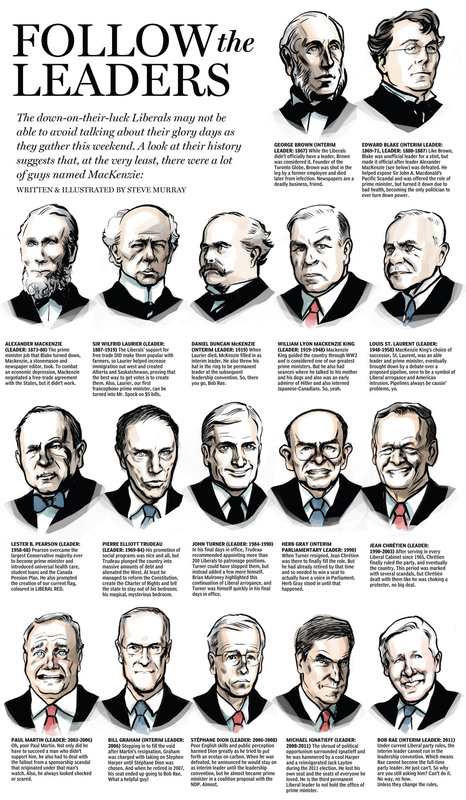 Leaders of the Liberal Party of Canada since 1867 — still as yet all white males! It is interesting to note that the arguments put in this resolution are similar to those which are traditionally put by republicans in Australia. Like Australia, Canada is a nation built on values such as fairness, egalitarianism and the idea that we are being hamstrung in becoming truly independent by the presence of a foreign head of state at the apex of our constitutional structure. 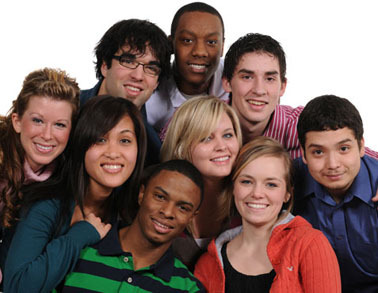 Young Liberals of Canada, sponsors of the 2012 republic resolution. The bottom line is that the republican genie is now out of the bottle in Canada. A major political party has debated the issue and nearly 40 % of delegates to its federal convention supported a Canadian republic. Those that did not did so mainly for tactical reasons or because of age. 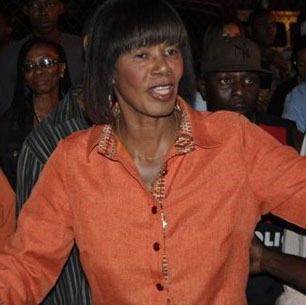 Portia Simpson Miller in Kingston, Jamaica, December 28, 2011, on the eve of her December 29 victory, when her People's National Party took 42 of 63 seats, with 53.4% of the popular vote. On January 5, 2012 Portia Simpson Miller was sworn in as Jamaica’s Prime Minister. Miller had previously served as Jamaican prime minister, from March 2006 to September 2007. But this time she was elected in a landslide. “But I think the time has come. In addition to the significant fact that Britain’s colonial legacy in Jamaica is a sorry one, one of the major drivers for Miller and her supporters is that Jamaica’s economic and cultural ties are now positioned towards North America. The move to become a parliamentary democratic republic with a ceremonial president also provides an opportunity for a broader discussion on Jamaica’s constitutional structure. What should be remarkable is not what is going on in other Commonwealth nations but that it surprises Australians at all. Surely, as a nation of the Commonwealth, we should be well attuned to the goings on of our fellow Commonwealth nations? Our membership of the Commonwealth, despite its significant duration, has never inspired in Australia any great sense of internationalism. The fact is that Australia is on many levels an insular nation. If we are to be a member of the Commonwealth (and republic or not chances are we will continue to be), it is important that we stay at least attuned to the developments in other Commonwealth nations, and to the changes occurring around us. The examples of Canada and Jamaica show us alternate paths and unfolding national narratives which should not be entirely lost on Australians. 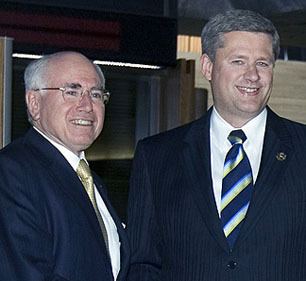 John Howard and Stephen Harper at Sydney Opera House,, September 7, 2007. TOM HANSON/CP. For Canadians, the skirmishes around Monarchist symbolism go far beyond a question of national tradition. In rebadging Canada’s military and institutions and reintroducing royal symbolism in to every day life, Harper is attempting to refashion Canadian national identity. 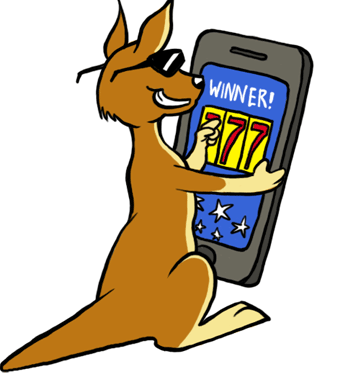 This should not be new to any Australian. 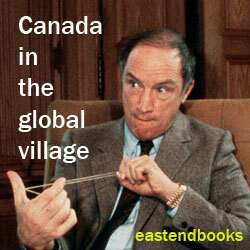 Harper’s monarchical fashioning of Canadian institutions is pure John Howard ‘culture wars’. Howard claimed the undeniably conservative social shift which took place in Australia under his prime ministership, of which monarchism was a hugely important aspect, was a “corrective in our national sense of self”. (9) Others have not been so flattering. But the response of Canada’s Liberals is similarly familiar. Like good culture warriors they have responded to Harper’s attack heartily, delivering in their republican motion what reads like a summary of liberal cultural values today : Multiculturalism, Egalitarianism, Democracy, Pluralism, and Republicanism itself. Thus the monarchy-republic skirmish in Canada is perhaps symptomatic of a broader conflict over national identity and may remain so for a generation, with a society divided between those who broadly regard their nations as secular, pluralist, liberal societies and those who see Canada as a nation bound to its Anglo-British tradition. This is the intellectual battlefield on which our modern republic debates in Canada and Australia are being played out. And the debate, in both countries, is far from over. 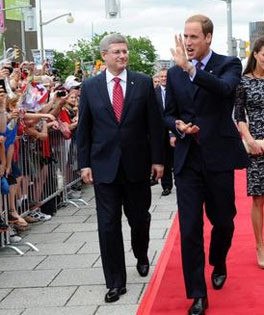 Harper may have his Royal Canadian Navy, but the majority of Canadians are nowhere near as enamoured with the British monarchy as his Conservative party. And while John Howard just a few years ago claimed triumph in his culture wars, the widely reported comments of eminent neurosurgeon Charles Teo, who recently recounted the story of his third-generation-Australian daughter’s battles with racism on Australia day, show that not everyone is happy with our so-called “corrected” national identity. 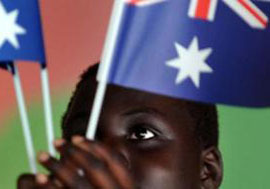 There is an exchange, at least in part, between those who see us as an integral part of an old British Empire, and the British Empire as an integral part of us, and those who see us, Australia and Canada, as nations who have outgrown our imperial pasts to become independent global citizens. It is a debate about national identity which continues as Canada and Australia change, and as the world changes around us, and the question of the republic lies at its heart. 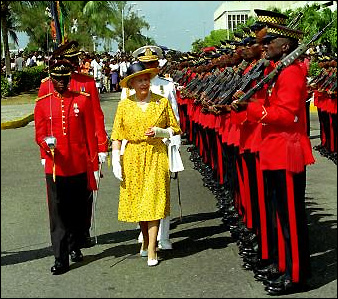 Queen Elizabeth II in Jamaica. There is no doubt where the Jamaicans sit in this debate. “But I think the time has come.” says Portia Simpson Miller. Time, for Jamaica, is 50 years since August 1952, when Jamaica first became an independent country in its own right. For Miller 50 years of independence is long enough. One has to admire Jamaica. It can apparently dive confidently into republicanism while Australia and Canada are, so far, reluctant to go the whole distance. The question for Australia is which path will we chose with our national identity? Do we want to be the self-confident, regionally engaged nation which emerges as Asia does? Or do we want to cling timidly to the coat tails of a United Kingdom of Great Britain preoccupied now more than ever with its complicated relationship with Europe? Do we want to endorse republicanism and true independence, like the majority of our contemporary Commonwealth partners, or to preoccupy ourselves with the past, with the faded traditions of an Empire which will play a smaller and smaller role in our story in the future? Republicanism will play a role in Jamaica’s future. In the end we believe it will play a role in Canada’s, and in Australia’s too. But do not think a republic is inevitable. In Canada, and in Jamaica too, it is a constitutional development which is wrapped up in complex questions of culture, nation and identity which are far too hotly contested in this country to declare such a development to be a fait accompli. We will ‘get a republic’ in Australia, but the global lesson is that we will not get one without a fight. The sun is setting on the British monarchy. The question is, do we have to set with it? 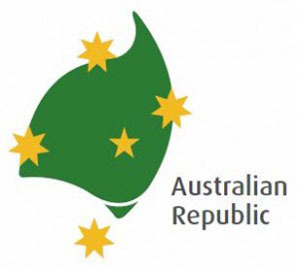 This is a somewhat condensed version of a paper presented to the Australian Republican Movement/Deakin University conference on the role of the Australian head of state, in Melbourne, Australia, on February 4, 2012. (2) J. Simpson (2009), Why Canadians owe great thanks to Michaëlle Jean, Globe and Mail, July 1. (4) J. Taber (2012), Liberals vote to keep monarchy, legalise pot at Convention, Globe and Mail, January 15. (6) BBC (2012), Jamaica to break links with Queen, says Prime Minister Simpson Miller, January 6. It was hard to take this piece seriously since it failed from the outset to fully understand the subject against which it rails. Either that, or it misrepresents the subject on purpose. Like the motion put forward by the Young Liberals at the Liberal Party’s recent convention, this article paints the Canadian monarchy as being a foreign and mono-national (British) institution imposed on Canadians in a colonial fashion, as though the 1926 Balfour Declaration, the Statute of Westminster 1931, and the Constitution Act 1982 never happened. (Worse, the Young Liberals seem to have never heard of the Magna Carta or constitutional monarchy.) The current prime minister is then derided for taking Canada back to colonial days by directing foreign missions to display a portrait of the Queen and for reinstating the Canadian navy’s and air force’s pre-1968 names. I wonder, do people who really believe that to be true not notice the Queen, in those portraits, stands before a Canadian flag and is wearing her insignia as sovereign of the Order of Canada and the Order of Military Merit?? Apparently these individuals are so fearful for Canada’s independence that they miss these obvious and distinctive signs of Canadian nationhood together with the country’s monarch. The fact is: Canada is an independent kingdom. That it shares one person as head of state with the UK has no bearing on its sovereignty; Canada being in personal union makes it as much a colony of the UK as the UK is a colony of Canada (again, read the Balfour Declaration and note the equality provisions). Disagree with monarchy if you wish (though, I’ve yet to hear a convincing argument in favour of a Canadian republic), but at least try to stick to the truth and not rely on nationalist, patriotic sentiment enflamed by lies about colonialism and invasive foreign institutions. In James’s mind these stubborn facts may have “no bearing” on perceptions of Canada’s sovereignty. But to those who lack his particular faith, inside and outside Canada today, they certainly do. It is similarly the plain truth that the monarchy in Canada is a legacy of the country’s colonial past. There are those in all of Australia, Canada, and Jamaica who like this colonial past and want to continue carrying on with some part of it. That is their right in the parliamentary democracies that all three countries are in practice today. But it is telling no “lies about colonialism” to recognize the colonial roots of the monarchy for what they are. I am a Canadian citizen whose loyalty is to the Canadian people and their Charter of Rights in the Constitution Act, 1982. To me Greg Barns and Henry Pill have a much fuller and more sensible understanding of their subject than the one to which James alludes. I also think they are quite right when they say that we are not going to get the free and democratic republics we want without a fight. And I’m certainly ready to start fighting. We are not going to let James and his fellow monarchists win by pretending they have some secret higher political knowledge the great majority of us lack. Democracy not monarchy is our future. England’s history is no model for a suppliant colony. How dare anyone say that Canada is not a colony. Every breathe and every deed of its elected officials must do everything in the British Monarch’s name. No Canadian can ever be Canada’s Head of State as the country is now positioned. The people of Quebec made their voice quite clear in initially voting down Rene Levesque’s separatist rhetoric and accepting Pierre Trudeau’s notion of a Canada bound by democratic principles with egalitarian values with its own residential Head of State. How happy the country will be if those fighting to keep Canada a colony would see the light and willingly concede to Canada’s full independence. Independence is a high value in the eyes of the English but these same people seem to be incapable of recognizing Canada’s need for independence. What is now happening in Canada is as direct violation of our rights. Why does Presidency have to be the automatic alternative to hereditary constitutional monarchy? Why not have an Elected Constitutional Monarchy as an alternative option? The office could be for life or until abdication or for a set term. Any Canadian, Australian or Jamaican could apply to be monarch of their own country. The term “president” has been overused as the title for a head of state. The term “president” actually means second in command. It derives from the President of Magdalene College Cambridge. The senior office there was Head of College and the deputy was President. In the 17th Century when Harvard University was being founded in the colonies they were waiting for a suitable candidate to fill the office of Master of College. As none was available the President (a former pupil of Magdalene Cambridge) was in put in charge temporarily. When no head of college emerged he became head of Harvard. So the president became the chief of Harvard and this continued and became part of their constitution. When the American colonies got independence they thought about a title for George Washington. They didn`t want the title of King so they chose the title of President in imitation of the constitution of Harvard. Thus the title of President derives ultimately from the second in command at Magdalene College Cambridge. So an elected constitutional King or Queen could be a more interesting alternative to the hackneyed term “President” : second in command! What do you think?